The Giant Talon 3 features a Shimano 3 x 8-speed drivetrain that will allow to comfortably spin you’re your way up climbs while providing plenty of gear to charge back down. A 100mm travel Suntour fork does a good job of easing trail chatter to provide a smooth and confident ride. Giant brand wheels wrapped in Maxxis rubber spin fast and smooth, supplying the grip necessary to attack off-road trails with authority. When it comes time to slow things down, Tektro hydraulic disc brakes will get you stopped on a dime in any condition. Topped off with a Giant brand cockpit, the Talon 3 is sure to provide you with many happy, carefree miles. Giant ALUXX-Grade alloy frame is lightweight and comfortable. SR Suntour fork with 100mm of travel. Shimano 3 x 8-speed drivetrain is simple and efficient. 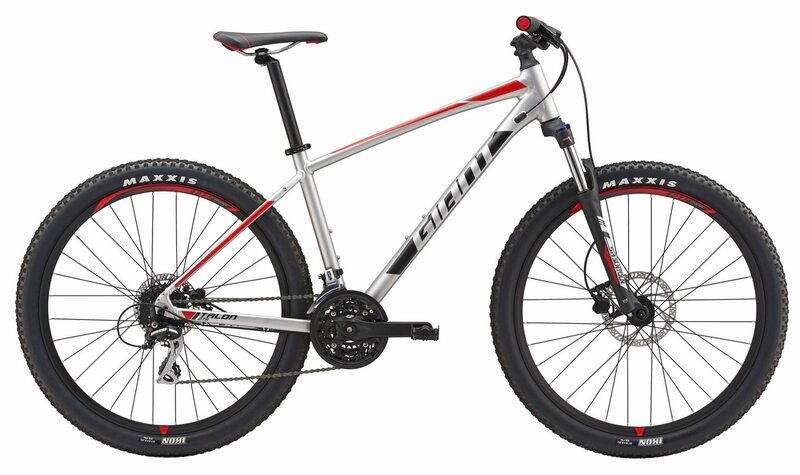 27.5" wheels and tires for speed and stability. Does this bike actually come with a dropper post? BEST ANSWER: This bike does not come with a dropper post. We apologize that we incorrectly included that in our description.